Get email updates about Barbara Bush delivered directly to your inbox. Thank you so much for being a wonderful First Lady. You always showed so much warmth and caring I felt like you were part of my family. You and George were wonderful parents and grandparents and the world would be a better place if people used you two as an example. Thank you too for being along side the President and giving him moral support while he was leading our country. I miss seeing your smiling face but you have truly earned your right to Rest In Peace. Its been one year since you went to be with God and Jesus. Mrs. Bush, you were an inspirational woman. Keep flying in the clouds with your husband and parents. Thank you for your 92 years of service in Texas. A dignified, loving and professional First Lady and Mother. An American treasure. 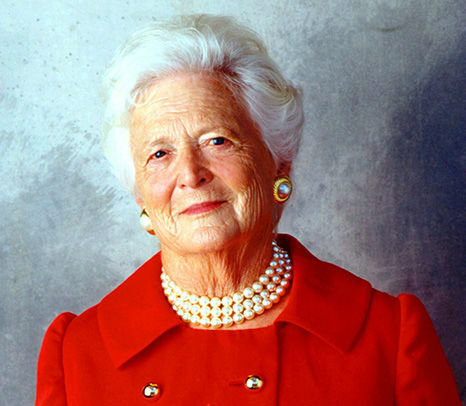 Our sympathy to the family of First Lady Barbara Bush. Thank you for sharing your mother with the world. May the presence and love of Jesus Christ fill your hearts with much grace and peace, as you mourn her absence. H.OPED FOR THE BEST IN EVERYTHING. lady also and a pretty grandmother and great grandmother too.